Mario Balotelli, the black Italian soccer star whose goals have fired Italy into the final of the Euro 2012 soccer championships on Sunday, was raised by a Jewish Italian foster mother from the age of three. 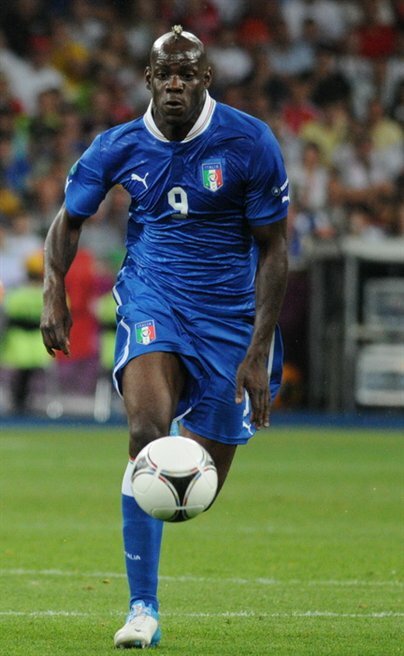 Despite his unpromising health and complex family background, Balotelli proved to be a soccer prodigy, becoming the youngest player ever to play in Italy’s third division, at age 15, and ultimately impressing as a player for top Italian side Inter Milan. He then moved to England’s Manchester City, with whom he won the Premier League title this past season. At the same time, he has been a figure of controversy, ridicule and affection over the years — sporting eccentric hair-styles, once having his UK home set on fire by errant fireworks, and being sent off intermittently for undisciplined behavior on the field. Prandelli has had his difficulties with Balotelli too, dropping him from one of the tournament’s earlier games, but his performance against Germany seems certain to ensure he’ll play in the final. I’ll be there and I see that Osler’s speaking on Sunday. Two late additions to the agenda: Dmitris Tzanakopoulos, the official UK representative of Syriza, will be speaking in the Saturday opening session, and on the Saturday lunchtime John Cunningham, secretary of the Spanish Miners’ Solidarity Committee, will be leading a discussion on the Spanish miners’ battle. The Saturday and Sunday of the event are at Highgate Newtown Community Centre, 25 Bertram St, London N19 5DQ . For the Friday venue see below. Ideas for Freedom is an event which combines a serious, thoughtful approach to socialist ideas with a commitment to activism in the workers’, student, feminist and other movements. We emphasise accessibility, self- and mutual education and free debate. For a report and pictures of IFF 2011, see here. As the capitalist crisis deepens and a variety of anticapitalist ideas take shape, this year’s Ideas for Freedom will focus on understanding what capitalism is and what kind of anticapitalist politics are necessary to fight and overthrow it. 1972-2012: How can workers fight and win? This year is the 40th anniversary of the magnificent working-class struggles of 1972, which prepared the way for the downfall of Edward Heath’s Tory government. We will be celebrating ’72, but also discussing the lessons of recent struggles in which workers have fought back and won. What are the lessons of the 1970s for our struggles now? Weekend tickets brought before the event (online here) are £26 waged, £17 low-waged/HE students, £6 unwaged/FE/school students. At the event £28, £19, £7. I’m worried about Bob Diamond. reducing its LIBOR submissions during the financial crisis as a result of senior management’s concerns over negative media comment. The BBA is currently undertaking a review of the way LIBOR is set and will publish its findings shortly. The FSA, along with the other tripartite authorities, is working to support market-led reviews of existing arrangements, with the goal of ensuring such arrangements continue to command the confidence of all stakeholders. Barclays co-operated fully during the FSA’s investigation and agreed to settle at an early stage. The firm qualified for a 30% discount under the FSA’s settlement discount scheme. Without the discount the fine would have been £85 million. This was a significant cross-border investigation and the FSA would like to thank the U.S. Commodity Futures Trading Commission (CFTC), the U.S. Department of Justice (DoJ) (together with the Federal Bureau of Investigation (FBI)) and the Securities and Exchange Commission (SEC) for their co-operation. The CFTC brought attempted manipulation and false reporting charges against Barclays for similar failings, which the bank agreed to settle. The CFTC imposed a penalty of US$200 million. In addition, as part of an agreement with the DOJ, Barclays admitted to its misconduct and agreed to pay a penalty of US$160 million. The Final Notice for Barclays Bank Plc. LIBOR and the EURIBOR are benchmark reference rates that indicate the interest rate that banks charge when lending to each other. They are fundamental to the operation of both UK and international financial markets, including markets in interest rate derivatives contracts. LIBOR and EURIBOR are used to determine payments made under both over the counter (OTC) interest rate derivatives contracts and exchange traded interest rate contracts by a wide range of counterparties including small businesses, large financial institutions and public authorities. Benchmark reference rates such as LIBOR and EURIBOR also affect payments made under a wide range of other contracts including loans and mortgages. The integrity of benchmark reference rates such as LIBOR and EURIBOR is therefore of fundamental importance to both UK and international financial markets. LIBOR is published on behalf of the British Bankers’ Association (BBA) and EURIBOR is published on behalf of the European Banking Federation (EBF). LIBOR and EURIBOR are calculated as averages from submissions made by a number of banks selected by the BBA or EBF. There are different panels of banks that contribute submissions for each currency in which LIBOR is published, and for EURIBOR. LIBOR and EURIBOR are by far the most prevalent benchmark reference rates used in euro, US dollar and sterling OTC interest rate derivatives contracts and exchange traded interest rate contracts. The notional amount outstanding of OTC interest rate derivatives contracts in the first half of 2011 has been estimated at 554 trillion US dollars. The total value of volume of short term interest rate contracts traded on LIFFE in London in 2011 was 477 trillion euro including over 241 trillion euro relating to the three month EURIBOR futures contract (the fourth largest interest rate futures contract by volume in the world). Until February 2011 the US dollar LIBOR panel consisted of 16 banks and the rate calculation for each maturity excluded the highest four and lowest four submissions. An average of the remaining eight submissions was taken to produce the final published LIBOR. Throughout the Relevant Period, the EURIBOR panel consisted of at least 40 banks and in each maturity the rate calculation excluded the highest 15% and lowest 15% of all the submissions collated. A rounded average of the remaining submissions was taken to produce the final published EURIBOR. The FSA Enforcement Conference 2012 – ‘Credible deterrence: Here to stay’ takes place on Monday, 2 July, 2012. Mahmoud Saleh and 59 activists arrested On Friday 15th June at noon, 60 members of the Coordinating Committee to Help Form Workers’ Organizations and a number of labour activists were arrested by agents of Karaj city. The detainees were transferred to Rajai Shahr prison in Karaj and until now no further news is available. We, members of the Coordinating Committee to Help Form Workers’ Organizations, condemn the arrest of the members and other workers activists. We demand the immediate release of all workers activist. We expect all workers activists and organizations to protest against these arrestments. UPDATE: As of 16 June, nine still remain in the custody of the intelligence office. Others including Salehi have been released. They are believed to be:- Cyrus Fathi, Alireza Asqari, Jalil Mohammadi, Saeed Marzban, Masood Salim Pour, Maziar Mehrpour, Reyhaneh Ansari, Faramarz Fetrat Nejad and Mitra Homayouni. Last week I got a bit of a shock when I saw a series of tweets full of praise and admiration for Clive James. Usually when a famous name trends on Twitter, it means the famous body attached to it has either died or done something scandalous, and the tone of the messages makes it easy to tell which is which: it’s a world of goodies and baddies, of bouquets and bollockings. One day someone’s going to die in the middle of a scandal and really catch everyone on the hop. It’s something I used to live in fear of when writing TV reviews: even though my articles appeared on a Saturday, my deadline was the previous Tuesday, which meant as soon as I filed my copy there was a four day window of uncertainty during which the people I was merrily slagging off that week might have been busy killing themselves or getting run over by trucks, thereby transforming themselves into tragic saints. And then, just as the wave of public sympathy crests, I pop up to say they’ve got a face like a butcher’s perineum and the mental agility of a cork in a milk bowl. I don’t even know what that last simile means, but it’s the sort of thing I say. The interview hadn’t been broadcast at the time: these lines were included in a couple of brief news stories about it (I say “news stories”, I mean “press releases”). Written down, it seems like a starkly bleak and morose thing to say; spoken aloud in the actual recording, it comes across as a reflective part of a warm, flowing, conversational whole. But the print version was the one many people encountered first, and, assuming he was near death, took to Twitter to speak of their admiration of Clive James, and to wish him well. I was one of them. There can’t be many writers of my generation who haven’t been heavily influenced by Clive James. In fact, as a former TV critic turned TV presenter myself, you could argue I’ve engaged in the sincerest (or most shameless) form of flattery by apeing his career, or at least part of it. Sadly for the poor bastards who have to scrape their eyeballs across my output – which right now means you – I am no Clive James. He has a way of gliding through sentences, effortlessly ironing a series of complex points into a single easily-navigable line, illuminating here and cogitating there, before leading you face-first into an unexpected punchline that makes your brain yelp with delight. He can swallow images whole and regurgitate them later as hallucinogenic caricatures that somehow make more sense than the real thing. He famously described Arnold Schwarzenegger as looking like “a brown condom full of walnuts”. That’s just brilliant. Every TV column I ever wrote consists of me trying and failing to write anything as explosively funny as that, for 650 words. That Schwarzenegger gag seems to have slightly haunted him, actually. In 2007 he told an Australian TV station it made him “nervous” because he had no idea how he thought of it. Which possibly explains why his stuff reads so effortlessly. The best bits simply fly into his mind without his face ever seeing them coming. So. Anyway. The media-centric wing of Twitter was filling to the brim with this kind of sentiment when happily, after about 30 minutes, a spokeswoman arrived to point out that Clive James is still very much alive, is “in fact in reasonable shape”, and is “looking forward to years of working”. At which point the tributes died down a little, not because they weren’t heartfelt, but because they suddenly looked a tad presumptuous. But it’s nice to think Clive James got to read a series of warm tributes while he’s still very much with us. Too often we speak warmly of people who influenced us when it’s too late for them to hear us. These days the custom for social-media addicts is to issue a sad 140-character epitaph accompanied by a link to a YouTube clip of one of their finest moments. Much more fruitful, if not very British, to gush at them while they’re still in the room. Not every day, that would be nauseating. But now and then. Hence the uncharacteristic and frankly mortifying level of gush I’m displaying right now. Thank you, Clive James; thank you. Jim Denham adds: James remains a true and honourable child of the sixties and the enlightenment. One of his finest hours in recent years has been the taking apart of the anti-enlightenment shyster, liar and bullshitter, Pankaj Mishra, here. As usual: game, set and match to James. Some of James’ recent poetry can be found at Standpoint. Socialist Worker has been hosting a debate on the Egyptian presidential election. In view of today’s announcement of a narrow victory for the Muslim Brotherhood’s candidate Mursi (or Morsi), this debate is of vital importance. Interestingly, the opening contribution from Alan Maass (below) argues for an abstention between Mursi and the candidate of the old regime, Shafiq. Maass explicitly criticises the (British) SWP’s Egyption group, the Revolutionary Socialists (RS) for advocating a vote (albeit “critical”) for the Brotherhood. Other contibutions, disagreeing with Maass, have followed, and he has written a further piece, replying to his critics, making for a lively and informative debate. Links to all the contributions can be found immediately below the main article. A “lively and informative debate” in Socialist Worker (?!?) I hear you cry in disbelief. I should have explained: this is the US Socialist Worker, paper of the American International Socialists, who may or may not still be linked with the British SWP. Alan Maass analyzes Egypt’s presidential vote–and the response of the left to a runoff that offers no choice for those who want to see the revolution’s goals advanced. EGYPT’S PRESIDENTIAL election has produced a runoff between Mohamed Morsi, the candidate of the Muslim Brotherhood, and Ahmed Shafiq, the last prime minister under Hosni Mubarak and an open representative of the old regime that was shaken to its roots by the mass rebellion that brought down Mubarak in February 2011. The results are a grave disappointment to supporters of the January 25 revolution. Shafiq is the face of the Mubarak security apparatus that so many millions of Egyptians rose up against. During his brief time as prime minister, he is believed to have helped organize the bloody Battle of the Camel last year, when thousands of pro-Mubarak thugs attacked the mass demonstrations in Tahrir Square. Shafiq’s main promise during the campaign was to bring security back to the streets within 24 hours of coming to power. That vow is universally and rightly understood to mean that he would unleash the military–which is already guilty of murderous crimes against protesters in the post-Mubarak period–to crush all dissent. For this reason, some on the Egyptian left are supporting a vote for Morsi of the Muslim Brotherhood in the runoff election–as a lesser evil to Shafiq. But the Brotherhood can’t be relied on to defend democracy if it wins the presidency. While harshly repressed under Mubarak, it vacillated during the 2011 rebellion against the dictatorship. Its members often played a leading role–for example, in defending Tahrir Square against Shafiq’s thugs–but the organization was very slow to participate at all in the demonstrations. Moreover, since Mubarak’s fall, the Brotherhood has collaborated often with Egypt’s military rulers, the Supreme Council of the Armed Forces (SCAF)–crucially, in opposing ongoing demonstrations when the military escalated its attacks on democracy protests. Within months of Mubarak’s resignation, Egyptian activists were describing the Brotherhood as seeking to become the “political arm” of the military rulers. The Brotherhood has had its own conflicts with the military, and the positions of its leaders aren’t always embraced by its supporters at the rank-and-file level. But at important points, the Brotherhood’s opposition to left forces has bolstered the position of the military. BOTH MORSI and Shafiq were late in entering the campaign–Morsi was a replacement for another Muslim Brotherhood candidate who was disqualified from the election, and Shafiq himself was initially disqualified because of his connections to the Mubarak regime, but won an appeal to the election commission. The two candidates did poorly in polls until the final weeks before the vote. But in the end, both of them blew past the frontrunner for most of the campaign, Amr Moussa, a former foreign minister under Mubarak and secretary-general of the Arab League until last year. Moussa was viewed by many as a candidate of the old regime, but with a more acceptable face, since he claimed to have differed with Mubarak. Moussa finished a dismal fifth–showing that supporters of the counter-revolution were strongly behind Shafiq instead. The two other leading candidates, Hamdeen Sabahi and Abdel Moneim Aboul Fotouh, were associated with the continuation of the revolution, and together, they got nearly 40 percent of the vote, far more than Morsi and Shafiq got individually. Sabahi was a long-time opponent of Mubarak, jailed 17 times for dissent against the regime. He took part in the mass protests of the January 25 revolution from the first day. As the candidate of the Nasserist Dignity Party, he finished with 20.7 percent of the vote, well ahead of what previous opinion polls predicted for him. According to the official returns, Sabahi won the vote in Egypt’s major cities of Cairo and Alexandria, and he did well in working-class areas. Aboul Fotouh is also a longtime dissident. He is a former leader of the Muslim Brotherhood who was expelled after he announced he would run for president, in spite of the Brotherhood’s previous promise not to field a presidential candidate. He was viewed as the moderate Islamist candidate in the election, with liberal positions on social issues, and supportive of the ongoing democracy protests. Sahabi may well have won enough votes to make the runoff. He finished less than 700,000 votes short of Shafiq, and there are charges of widespread fraud, including an allegation made by a police officer that Shafiq got 900,000 votes from soldiers illegally assigned ballots by the Interior Ministry. But Egypt’s election commission ratified the outcome of the first round of elections without hearing a single appeal–a further sign that the regime is backing Shafiq by any and all means. The turnout for the election–the first presidential vote in the post-Mubarak period–was unexpectedly low, at just 46.4 percent of eligible voters, according to the final totals. This was short of the overall 54 percent turnout in parliamentary elections held over a six-week period from late November to mid-January. Neither the turnout nor the top finishers in the first round of presidential voting reflects the spirit of last year’s January 25 revolution, which depended on a mass mobilization demanding freedom and an end to autocratic rule. Instead, they show that the military and economic power structure which was shaken by Mubarak’s fall has regained initiative and confidence–and that the Muslim Brotherhood still commands the support of millions, despite its compromises with the old regime in return for a share of the power and profits in Egypt. THE LEAD-UP to the second round of the voting, set for June 16-17, will be tumultuous. Shafiq was also bitterly opposed in the first round. On the day he cast his own ballot at a polling station on the outskirts of Cairo, he was confronted by an angry crowd who pelted him with stones and shoes. Among the demonstrators were relatives of protesters killed in the January 25 Revolution, who carried pictures of their martyred loved ones. Hours after the election commission officially recognized Shafiq as one of the two candidates to advance to the runoff, protesters attacked the candidate’s campaign headquarters in Cairo, breaking into the building and setting fire to it. Other democracy activists gathered in Tahrir Square, as well as in Alexandria. No one should underestimate the threat that Shafiq would represent if he came to power as president. Many Egyptians no doubt plan to vote for Morsi, as a defense of the revolution, despite their differences with him–because they detest the prospect of an apparatchik of the old regime winning back power. But at the same time, others are furious that their only other choice in the runoff is Morsi. “I can’t support Shafiq, and I can’t support Morsi,” one protester at the demonstration at Shafiq’s headquarters told a reporter. At the start of the week, eight liberal and leftist parties held a meeting to announce the formation of a “united front” of organizations that would refuse to support either candidate in the runoff. The meeting was attended by presidential candidates Amr Moussa and Khaled Ali, a human rights lawyer who was the most radical of the 11 people on the ballot in the first round. Surprisingly, Egypt’s Revolutionary Socialists (RS) issued a statement that implicitly supports a vote for Morsi in the second round of the election, while calling on the Muslim Brotherhood to meet a series of demands, including accepting Sabahi and Aboul Fotouh as co-vice presidents; choosing a prime minister from outside the Brotherhood’s ranks; dropping its own proposal for labor legislation in favor of a law that guarantees union freedoms; and agreeing to a constitution with guarantees of numerous rights and liberties. The statement raises many troubling questions. For one thing, the RS has explicitly described the Muslim Brotherhood as having “an interest in sharing power and wealth with the old regime without making fundamental or radical changes to its social and economic policies, or disturbing its vested interests and international affiliations,” in the words of one of the group’s statements. As for its demands on the Brotherhood, what if the Brotherhood–universally acknowledged as the largest political organization in the country–doesn’t meet them, as seems most likely? The RS has already effectively called for a vote for Morsi in order to defeat Shafiq. TO BE sure, Shafiq is the candidate of the counter-revolution, and he has to be exposed as such and confronted with protests, just as people took to the streets earlier this week when his spot in the runoff was confirmed. But it’s quite another thing for socialists to call for a lesser-evil vote for the candidate of the Muslim Brotherhood, an avowedly pro-capitalist organization committed to Islamist politics. The Brotherhood doesn’t oppose the hated neoliberal economic policies of the old Mubarak regime and the current military rulers. Indeed, in some ways, it is an even more enthusiastic supporter of free market policies–its criticisms have been limited to the endemic corruption of the old order. The Brotherhood has even agreed to negotiations with the International Monetary Fund on the same conditions as the old regime. When it comes to unions and strikes by Egyptian workers, the Brotherhood and the SCAF have spoken out as one against them. Workers provided the final push that shoved out Mubarak with a wave of strikes in February 2011, but the Brotherhood quickly called for the walkouts to end, in the name of saving the Egyptian economy–the identical line of the military rulers and Egypt’s capitalists. Also, of course, the Muslim Brotherhood is committed to political Islamism and is conservative, on the whole, on many social issues. Morsi, for example, is viewed as a representative of the right wing of the Brotherhood. He has spoken in favor of barring women and non-Muslims from Egypt’s presidency. More radical Salafist groups are guilty of deadly terrorist attacks against Egypt’s main non-Muslim minority, Coptic Christians. Shafiq and other representatives of the old regime have used anti-Islam scaremongering, in the presidential campaign and long before it, to win support against the Brotherhood. They, of course, have no interest at all in guaranteeing equal rights for Copts and women, or standing up for unions. But while the Islamophobia of the military rulers should be challenged, no one should close their eyes to the Brotherhood’s actual politics. And just as more extreme Salafist organizations benefited from the Brotherhood’s win in parliamentary elections, a further extension of the Brotherhood’s political power would give them greater prominence. Perhaps most important of all, the Brotherhood has again and again proved unwilling to defend the revolution when the military council lashed out at protesters demanding democratic rights and an end to repression. On the contrary, it has often denounced demonstrators facing the wrath of the regime as “counterrevolutionary”–providing a cover for the SCAF to escalate its violence against activists. the picture of Lt. Gen. Sami Anan [deputy chairman of the SCAF]–his hands stained with the blood of hundreds of martyrs and thousands of injured–in a historic embrace with the Muslim Brotherhood’s Muhammad Mursi and Saad al-Qahtani, demonstrating that both sides’ fear of the third force (the masses who have an interest in deepening the revolution on a political and social level) is much greater than their differences over how to divide the political spoils between them. The Brotherhood has a firm ruling majority in parliament, and potentially, control of the presidency. But how would Morsi assert control over the armed forces? It seems completely plausible that the Brotherhood would rely on a representative of the old apparatus–if not Shafiq, then someone very much like him. Egypt’s presidential election has starkly revealed the threat to democracy, in the form of Ahmed Shafiq. But the movement won’t be defended by supporting a party that has embraced neoliberalism and authoritarian politics in its agreements with the military. The key will be independent working class organization that can respond to all threats, in whatever form. Check back to the SW site for more contributions in the coming days. Why do some people think that campaigning in solidarity with the Palestinians is “a bit anti-Jewish”? This is the question (supposedly) addressed by an article in the spring newsletter of the Scottish Palestine Solidarity Campaign (SPSC). Of course, we can and should support Palestinian rights without being at all anti-Jewish. But there are many reasons why some people think that the dominant form of what passes for Palestinian solidarity is “a bit anti-Jewish” (or maybe rather more than just “a bit”). Some people may have found it “a bit anti-Jewish”, for example, when the SPSC marked Holocaust Memorial Day by reading extracts from a play (“Perdition”) which claimed that the Holocaust was made possible by Zionist collaboration with the Nazis. Commemorating another Holocaust Memorial Day by giving a platform to a pro-Hamas supporter of suicide bombings who has advocated that Israeli Jews should “go back to Germany” (Azzam Tamimi) might have struck some people as “a bit anti-Jewish” as well. And then there is the SPSC’s spirited defence last year of one of its members, charged and found guilty of racially motivated breach of the peace after abusing a Jewish student. (His appeal, heard earlier this year, was thrown out in less than a minute.) This too might seem “a bit anti-Jewish” to some people. Other reasons why what passes for ‘Palestinian solidarity’ might be deemed “a bit anti-Jewish” include: incorporating traditional anti-semitic tropes into criticisms of Israel; judging Israel by standards not applied to other countries; forming alliances with anti-semitic organisations; and refusing to recognise national rights for Israeli Jews. But none of the above is dealt with in the article in the PSC newsletter – despite the fact that these represent the actual substance (or some of it, at least) of the charge of anti-semitism which is raised against a certain form of ‘Palestinian solidarity’. Instead, but all too predictably, readers of the article are treated to a particularly crass version of a Zionist conspiracy theory (i.e. in order to rebut the charge of anti-semitism, the writer employs a traditional anti-semitic trope). “Those who accuse us of anti-semitism can be divided into roughly two groups,” explains the writer. “One is calculating and prepared to use any lies to further their own interests,” he continues, “the Israeli elite benefit from favoured relations with the EU and billions of dollars in aid from the USA.” In other words, and more succinctly: rich Jews. Anti-semitism, by this logic, is not a real phenomenon. It is a false accusation made in bad faith by “the Israeli elite” and “many Israeli politicians” in order to promote their own interests and stifle criticism of Israel. Yes indeed! Every non-Jewish primary school pupil in Glasgow knows “the story of the Jew Leon Trotsky.” Only the Jewish ones, left in ignorance by a few strokes of the “Zionist censor’s pen”, are unaware of the 1905 St. Petersburg Soviet! Even by the SPSC’s own standards, this is a dire level of argument: somewhere in the world there is a Board of Zionist Censors, controlling everything read by Jews in order to ensure that they do not discover “the complexity of history”. Thus, one group of Jews raises the accusation of anti-semitism out of malice, and the other out of ignorance. It’s as simple as that! But what of ‘left-wing’ revisions of the Holocaust, in which the latter is portrayed as a joint Zionist-Nazi endeavour, which Zionists exploited (“ruthlessly”, as the SPSC writer would put it) in order to establish Israel? The SPSC is not only silent about that form of revisionism, but actually propagates it. But all this is of no account to the SPSC. Having dismissed to its own satisfaction accusations of anti-semitism as lacking in substance, it can now continue with its vital building of ‘Palestinian solidarity’. Anyone wanting to know what a Zionist, and presumably therefore “ruthless”, bowling team looks like can click here. The SPSC’s John Wight: a Nazi-quoting antisemite. You’ve just got to laugh, eh? “In a series of covertly recorded meetings, K2’s providers did not divulge his name but boasted that ‘a top-level comedian’ had used the K2 scheme for a number of years. ‘How much is the highest amount you think we’ve got going through this solution?’ Roy Lynass of Peak Performance Accountants, asked businessmen in March. ‘£3.3 million. That’s actually a well-known comedian. “‘He’s got his own company, it’s making about £4-£4.5 million. He pays himself £100,000 salary and puts through £3.3 million'” –The Times, June 19 2012.